Libertytown Park contains two baseball fields, one for Little League and the other a regular sized ball field, as well as a basketball court, three tennis courts, and a large field space for football and soccer. There is also a managed wildlife trail and native Bob-white Quail protection area of 2.4 miles (3.9 km). ^ "Geographic Names Information System". Libertytown (Populated Place). U.S. Geological Survey. 2009-01-29. 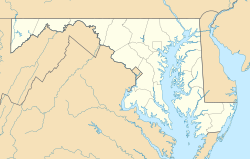 ^ a b "Geographic Identifiers: 2010 Census Summary File 1 (G001), Libertytown CDP, Maryland". American FactFinder. U.S. Census Bureau. Retrieved June 1, 2016. This article about a location in Frederick County Maryland is a stub. You can help Wikipedia by expanding it. This page was last edited on 8 November 2018, at 22:25 (UTC).